I've got a few water pumpers in the fleet namely 3 Buick Lesabres that were given to me. I hate FWD cars so I was thinking about selling them and getting some other modern car for a daily driver. Maybe a '62 215 V8 Tempest? They seem pretty cool. worked for me since the 60s. Doing that today. 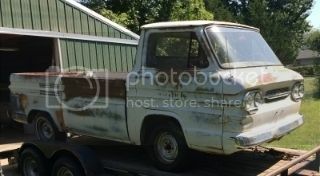 My goal is actually to get rid of all my other junk and just have Corvairs. 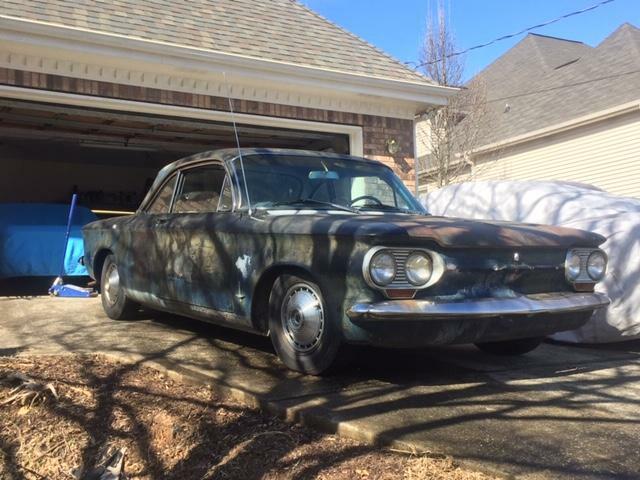 I may keep my long wheel base G30 to pick up boat loads of Corvair parts in. le sabres with the 3800 can be nice work cars. I've had a few, theyll do 25 mpg on the highway, which was great when my workspace was moved to Duncanville for several months. Of course, they have the orange antifreeze eats the headgasket issue that can rear its ugly head. 25 is the worst average I've ever had with a lot of city driving. I always get better than 30 on the highway. Best of about 34. They are probably really good for FWD junk but they are still FWD. I've never heard of head gasket issues but plenty of intake gasket and intake manifold issues. I had a FWD LeSabre and it got consistently 34-35 on the highway. If you sell, I might be interested. 1980's El Camino. Thats my DD aside from the Corvairs. Reliable for its age. Always have the truck bed for hauling parts and equipment. 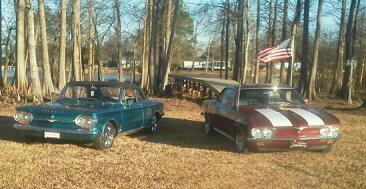 I have a '62 Buick with the 215. It's neat but no better then the Corvairs for daily driving comfort and reliability. My Corvairs have been a lot more reliable than the Buicks. No dead coils, no leaky intake gaskets, no broken window regulators, no crazy HVAC duct motors etc. Might have to take you up on that Bob. The 2001 only has 60k on it. Good luck finding a 62 Tempest with the 215. They are non-existent. I believe that less than 10% of all 61 and 62 Tempests were built with the 215. Many more 63s with the 326 though. Had to have the 4-speed and A/C too. > getting some other modern car for a daily driver. I not very interested in something that highly regulated. My 99 S10 LS regular cab 2.2 5 speed was a great DD except for lack of power. 25-27mpg, and I could put a lot of stuff in the bed. That looks like a good deal in the pics at least. I'm more of a rear-wheel drive kind of guy too Joel. And a truck guy too I suppose, but for 40 years my favorite car was still my first '66 Corsa. Not because it was the best at everything, but because it was very capable, neutral handling and had a sweet dash layout. Was also stone reliable (mostly) for years. My fave that is, until I bought my current 2004 Buick Regal GS. It's not quite as sweet as the old Corsa was, but it's truly better in every way except city fuel economy. It's very neutral handling for a front-wheel drive car, has gobs of power (a truly surprising amount actually) and is quite the fun drive in the twisties and in traffic. So while you were saying you did not want something so regulated, and you obviously already have had your fill of Buicks perhaps, I'm impressed enough with this particular one to mention it in this discussion. Has never let me down, taken only regular maintenance, has 167k miles on it and continues to impress. The most common replacement I've done so far are tires. I don't wear them out (tread-wise anyway) but the handling is so precise I can feel when a tire is not a good match. So against my normal practice of waiting until tires are done for, I've replaced three sets for having insufficiently good street manners (whether that be handling, smoothness, quietness, or fuel economy) and am on my fourth now. Being the Joseph Abboud edition was what sold me in the first place. Was not a fan of the rear door opening design and short rear deck area/wheelbase, but the color and the uber-sweet interior were why I did it. You never know. One of those might be a reasonable replacement. That '62 Buick is cool. One problem with daily driving my Corvairs is they all live in the shop or carports in the back. I can't get them out when it's muddy and I have to open and close my gate. I need to build a 10 car garage in the front along my driveway to avoid the mud and gate. Le Sabre is probably one of the best American made cars out there.Nice ride,quiet,great on gas and "invisible to the law" if you know what I mean.